A flexible nanowire device has been created that can store data electrically, and is non-volatile (it retains the data even when the power is turned off). MINIMIC FILM: shigawire of one-micron diameter often used to transmit espionage and counterespionage data. 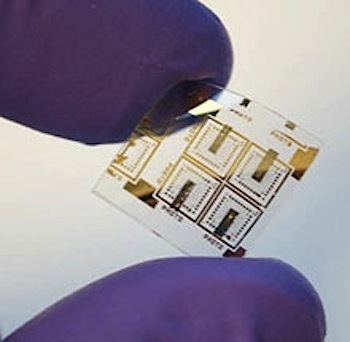 The real-life research into bendable nanowire memory devices was undertaken in the UK; Junginn Sohn, a researcher at the University of Cambridge Nanoscience Center, is the lead author of the Nano Letters paper describing the device. The new memory cannot hold data for as long as flash, and it is slower and has fewer rewrite cycles, but it could potentially be made smaller and packed together more densely. And its main advantage, says Sohn, is that it is made using simple processes at room temperature, which means it can be deposited on top of flexible plastic materials. Nanowire memory could, for instance, be built into a flexible display and could be packed into smaller spaces inside cell phones, MP3 players, plastic RFID tags, and credit cards.